Discover the music of New Zealand singer/songwriter Bryce Wastney. 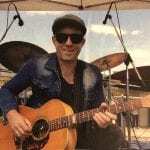 Inspired by the music of Cat Stevens, Neil Finn & the Beatles, Bryce’s music traverses folk, country, rock and pop – always soulful whatever the genre. It’s the ideal soundtrack for the traveler and free spirit in us all. Bryce has released 3 full length albums, a 6 track Acoustic EP, a book and the Songbook & Six String live concert collaboration (CD + DVD) with New Zealand music icon Paul Ubana Jones. They are all up on Spotify, iTunes and all the best online stores. Signed CD’s available from the SHOP page. Listening to Bryce Wastney’s third studio album True North is like catching up with a dear old friend. It’s warm, intimate, honest and a lovely reminder of the shared bond you have. He’s a master craftsman — perhaps something he perfected as a boat-builder. Songbook & Six String with Paul Ubana Jones, Theatre Royal, Nelson, May 1 2015. By Jacquie Walters.